Quick Robin! The Bat Keychain! We don’t know if Batman has a keychain for the keys to the Bat mobile, the Bat copter, and all his other vehicles. But we are guessing if he did, it didn’t look like the one [krishnan793] picked up cheap. It had a little button that lit up some LEDs and played a little tune. [Krishnan] thought he could do better with an ESP8266. After chopping up some headphones and adding a LiPo battery, he wound up with an improved key chain you can see in the video below. The first video is the before video. The second is after the modification. Sure, it is only a small improvement on LEDs and a simple tune, but now it is hackable to do more interesting things if you want to take the trouble to do so. Lowe’s, the home improvement big box store, is selling some home automation items which might be Xbee compatible. They’re being sold under the brand name Iris. There is some debate as to whether they’re Xbee, or just 802.15.4 hardware. Either way they might be worth checking out for your wireless projects. [TopHatHacker] was surprised to see a full-sized SD card slot on the Raspberry Pi. His temporary solution to get his microSD card working was to uses a miniSD adapter. He cut away the case and bent the pins until they lined up with the microSD card. Batman’s ability to fly is a falsehood. Or at least so says science. We didn’t know science was into disproving super-hero movies (that’s a deep well to drink from) but to each his own. But back in December the Journal of Physics Special Topics took on the subject with their scholarly paper entitled Trajectory of a Falling Batman. The equations presented in the two-page white paper may be above your head, but the concepts are not. It’s not that Batman can’t fly in the way explained in the film. It’s that he can’t land without great bodily harm. By analyzing the cape in this frame of the film, researchers used Batman’s body height to establish wing span and area. The numbers aren’t good. Top speed will reach about 110 km/h with a sustained velocity of 80 km/h. That’s 80 mph at top speed and just under 50 mph when he comes in for a landing. Oh Batman, how you’ve let us all down. If you liked this paper, you should dig through the archives. We always wondered if [Bruce Willis] could have actually saved the world from an asteroid. [Chris] over at the New Hobbyist sent in his latest creation, a wireless light switch hidden within a statue bust. While shopping around for another project, he came across a wireless relay that can can be used to switch a standard 120v AC load. He bought the part without a project in mind, but inspiration quickly struck. Some of you young’uns might not remember the original Batman television series, but [Chris] certainly does. To access the Bat Cave, Bruce Wayne had to flip a secret switch located inside a bust of William Shakespeare that adorned his desk. While he doesn’t have a secret door to activate, [Chris] couldn’t think of any better way to switch on the lights in his man cave. 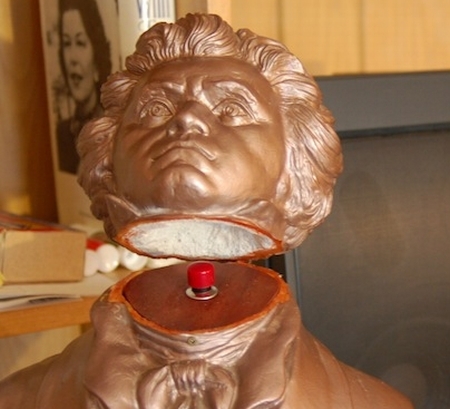 He found a similar-looking bust of Beethoven and got to chopping his head off. He fabricated a small mount for a push button, hiding the battery powered remote underneath, and an old 12v wall wart was repurposed to drive the wireless receiver. While not overly complicated, this is definitely a fun project and could make for a neat light switch in a kid’s room. Interested in some more Batman inspired hacks? Be sure to check out this Bat Cave-style entrance switch from a few years back. Keep reading to see a video of his hidden light switch in action. 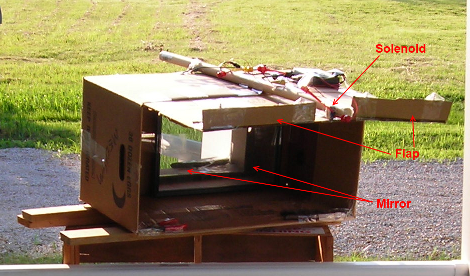 [Matt Meerian] introduced us to his kludge of cardboard, tape, mirrors, and electronics in the form of a clever non lethal robin trap. Whenever a pesky robin would enter the box, a sensor is triggered, the solenoid drops a lid, and the bird is contained (and we assume taken far away after that). Of course the plan backfired; we wont spoil what happened, but you can click the link above to find out. Want to enter your hidden lair in style? Well [Jimmy] simply wanted to create a cool prop for his school’s homecoming dance. This project includes some obvious inspiration from Wayne Manor. [Jimmy] wired up the automated entrance with a 12VDC motor. In order for it to be able to push the door , the motor had to be attached to a gearbox, which directly powered a wheel. Current consumption issues were solved by using a wall-wart. Because a real bookshelf would still be too heavy, [Jimmy] dressed up a regular door with some patterned wallpaper to give it the right look. Coupled with a Shakespearean bust concealing the button, and some other cosmetic touches, this project was sure to impress any student who knew its secret.